This cemetery is in the Concord Community in Anderson Co. TX. 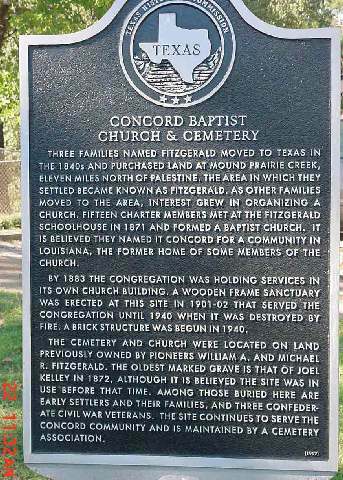 There is a Concord Baptist Church next to the cemetery. This community was called "Fitzgerald Tow" at one time because there were a lot of Fitzgerald's buried in the Cemetery and also some Hanks are buried there. This is a fairly large cemetery and probably an old one too. The oldest burial date on a marker is 1872 but there are probably older graves that have no markers. There are a lot of graves marked only with concrete blocks, iron or rocks, or unreadable Funeral Home Markers. Hutcherson J.A. Apr 22 1890 Jun 12 1991 SW Annie L.
Hutcherson James Oscar Dec 23 1888 Apr 22 1976 SW Lillian A. Ward Eula Feb 26 1890 Dec 15 1953 SW RL "Bud"